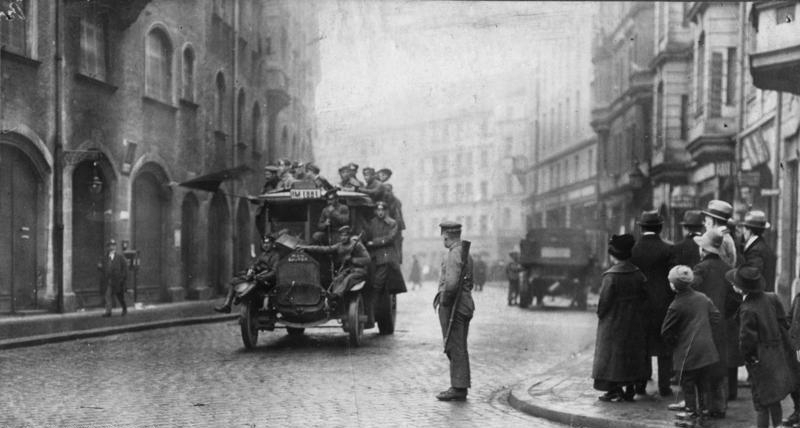 Only lasting through early May to be occupied by the German Army and paramilitary Freikorps, the Bavarian Socialist Republic (Soviet meaning advisory council or committee, Rat oder Berater, in Russian) was established on this day a century ago, emerging from the failed breakaway state of journalist, theatre critic and revolutionary Kurt Eisner’s (*1867 - †1919) People’s Republic of Bavaria—which similarly expressed the former Wittelsbacher kingdom’s unwillingness to align itself with the newly minted Weimar Republic (previously here and here). In the power vacuum that followed Eisner’s assassination by unionist and royalist Anton von Padua Alfred Emil Hubert George Graf von Arco auf Valley (*1897 - †1945) and encouraged by news of a left-wing uprising in Hungary, communists took power, exiling the successor socialist executive who set up an opposition government in Bamberg, while Expressionist playwright Ernst Toller (*1893 - †1939) was installed as president of the republic in Munich. Extolling a revolution of love and promoting many utopian ideas—though failing with effective cabinet and commissarial selections that could enact or at least not be antithetical to the principles, the new regime was labelled as a bunch of coffeehouse anarchists. After six days, Toller’s rule was toppled and replaced by Eugen Leviné, whose reforms were highly effective but whose methods were also highly draconian. With the support of Vladimir Lenin, Leviné’s government expropriated private property, rededicated churches to the Goddess of Reason and took members of the upper-class hostage. 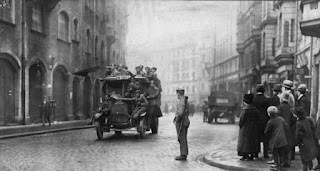 Factional fighting between those loyal to the administration based in Bamberg and the government in Munich grew increasingly violent and eventually drew in the national army. 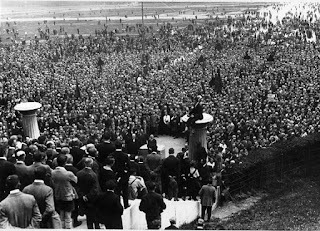 The communists were defeated with much bloodshed on 6 May and the Free State of Bavaria (Freistaat Bayern) was declared within the Weimar Republic under its new constitution on 14 August.